Samsung has unveiled details of its soon-to-be-released Galaxy Player, a handheld device that offers a choice of different screen sizes to let users view movies, play games or run Internet applications on the go. The Galaxy Player will come with 4-inch or 5-inch screens and is intended to be used as a media consumption device, said Tim Baxter, president of Samsung Electronics America, during the player's official launch in New York City. The device offers a "fun way to enjoy games, music, videos and social media," Baxter said. The player was previewed at Mobile World Congress in Barcelona last month. The Galaxy Player is small enough to fit easily in a pocket, Baxter said. The 4-inch device weighs 5 ounces (141 grams), while the 5-inch device weighs 7 ounces. The Galaxy Player runs on Google's Android 2.2 operating system, code-named Froyo. The device will be upgradable to Android 2.3, the company said. The device will support Adobe's Flash to view and interact with Internet content. It will be released in the first half of the year in the U.S., according to a company spokeswoman. Company officials declined to comment on pricing and worldwide availability. Both models offer Wi-Fi connectivity and front and rear cameras. The 5-inch model also includes a flash for photography. The devices come with 8GB of on-board storage and include microSD slots for up to 32GB of extended storage. Samsung offers tablets and smartphones under the Galaxy brand. The company will share more plans around its Galaxy strategy at the CTIA Wireless trade show, which will take place March 22 to 24 in Orlando, Florida. 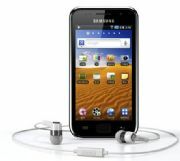 Except for the screen size, the Galaxy Player is similar in characteristics to Apple's iPod Touch, which comes with a 3.5-inch screen. The devices do not have the capability to make phone calls. The iPod Touch runs on an internally developed A4 processor and can display images at a 960-by-640-pixel resolution. The Galaxy Player will be able to display video content from some Samsung TV models as part of what the company calls an "end-screen strategy." Content from TVs will be wirelessly transmitted for display on Galaxy devices, including Players. This feature is part of Samsung's Smart Hub strategy for users to discover and share content across devices such as tablets, mobile phones, cameras and TVs.